After settling in to our accommodation, we went for a walk around the Launceston CBD, including The Quadrant and The Mall. My three year old and six year old easily managed a leisurely stroll around the CBD — Launceston is a small city. A recurring theme in Tasmania is the lack of children’s play equipment in parks. There was a play ground in Queens Park and a few swings in another park, but apart from that, children’s play equipment seemed to be scarce in Launceston. Perhaps we were looking in the wrong parks? The theme of bad coffee on my road trip between Brisbane and Tasmania continued into Launceston. We could not seem to find a decent coffee anywhere. Our first full day in Launceston was spent with a half-day trip to Bridgestowe Estate Lavender Farm, which is outside Launceston in Nabowla (near Scottsdale). 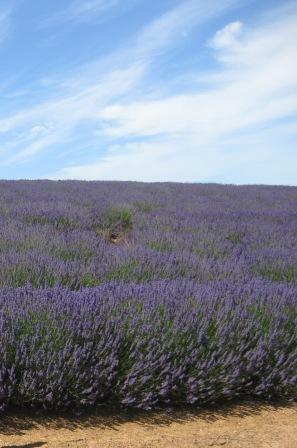 We were there at the right time of year (December and January) to see the fields of lavender in full bloom. As you would expect, there was a shop where you could purchase lavender products, as well as a cafe.